Come join us next fall!! Study about Japan and the Far East while experiencing it! Learn and speak Japanese every day both on and off campus! Experience dorm life with Japanese, Korean, Chinese, and other international students from around the world! Worship and serve in local Japanese, Korean-speaking, Chinese-speaking, and/or English-speaking churches! Join in field trips that make your classroom studies come alive! Live and study in Japan at a fraction of the cost of comparable programs!! Thank you for your interest in EAI! Applications for the 2019 Fall Program are now available to download from here. 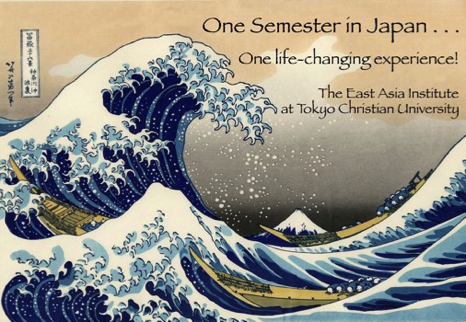 Please contact the TCU Admissions Office (eai@tci.ac.jp) if you have any questions about the East Asia Institute. Visit our Asian Christian Theological Studies for English Speakers (ACTS-ES) website for information about our four-year program.